← Tribbles hell, I've got your trouble right here. E350 requested a Spitfire as the prize for winning Caption Contest 122, and it's now live in Companions-Vehicles. I drew it from this perspective instead of the direct side view E350 sent, as I thought this profile would be more versatile -- you can black it all out for a distant silhouette in the sky for instance, and still know what it is. This entry was posted in Challenge Prizes. Bookmark the permalink. Doesn’t matter if it’s from dblade or Jeff himself. New item day at Heromachine is always call for celebration. 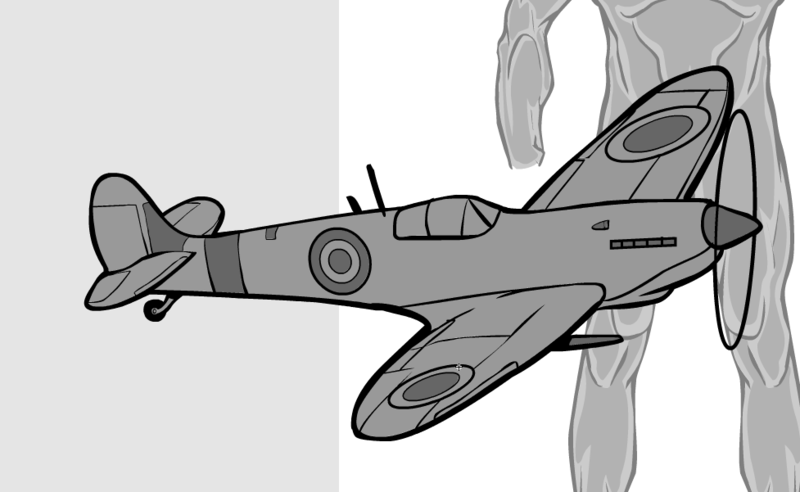 The Spitfire looks awesome, man. Thanks for the kind words, sir! Very cool. Great for some old timey scenes. Jeff? Is that within sizing range of both a parachuting pilot and a King Kong? I’m hopeful. Looks nice. I’m not sure, you’ll have to play around with it.